Below are some of the common things that I feel are overlooked when treating patients who have undergone ACL reconstruction. I know there are others, but I thought the 5 below were a good start. Feel free to add your thoughts in the comments. By “why” I mean why did this person tear their ACL in the first place. This is something that I overlooked early on in my career as I was super-focused on addressing their impairments from the surgery and not looking at the big picture. Figuring out why your patient tore their ACL is especially important if they had a non-contact ACL injury (and key to reducing their chance of re-injury). A non-contact ACL tear is a symptom of a poor movement pattern or (patterns), so you have to figure out what movement patterns contributed to them tearing their ACL - is it limited dorsiflexion, poor motor control, a combination of a few things, etc. If you don’t do this and simply rehab their post-surgical impairments, you are doing them a disservice and setting them up for future issues. And I realize that you can’t assess all the movement patterns initially (due to surgical pain, ROM limitations) but around 2-3 months after surgery, you should be able to assess most movement patterns. Notice how I said symmetrical and not 0°. I feel many therapists stop working on knee extension when their patient’s knee gets to 0° - this is not full ROM if their other knee can hyperextend (which it more than likely does). Typically, I stop working on gaining extension when a patient can actively get within 1-2° of the uninvolved (i.e. if uninvolved active extension is hyper 6° I’ll stop working on the involved extension when the patient can actively get around hyper 4°-5°). I do this because I find that the last 1-2° tends to come as the patient’s activity level increases. You should still assess and monitor it each visit to make sure it’s progressing though (if not, obviously address it). 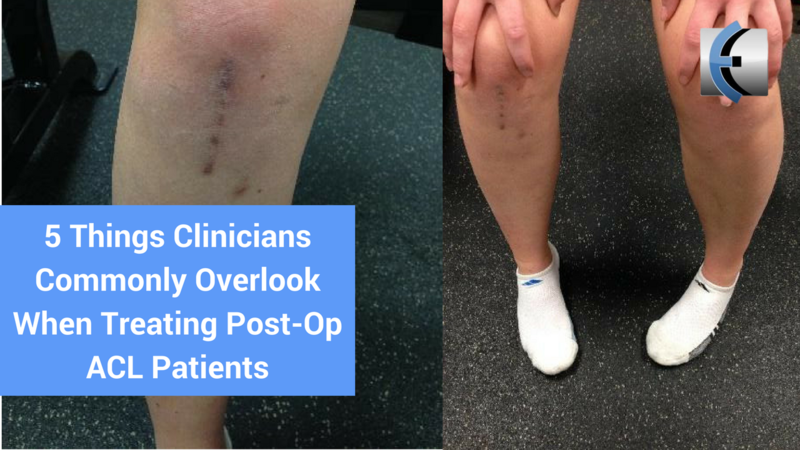 This is something I definitely overlooked in this patient population until around 2 years ago, when I started to realize the significance of tibial rotation and assessing/addressing it regularly. I was definitely taught to assess it in school, albeit not on post-op ACL patients, but I downplayed its significance…oops. Commonly, I find tibial internal rotation to be limited in ACL reconstructed knees. And if you send someone back on the field with limited tibial IR, then that will most likely cause the femur/hip to compensate for that lack of motion and put the knee in a vulnerable position…and possibly re-tear the ACL. Make sure when you check tibial rotation that the patient isn’t wearing sneakers (this way you can see any compensations/effort throughout the foot) and that their knees are stabilized so they don’t move. This is one area that I have always stressed with my patients, as it was heavily emphasized by my professors/clinicians when I was in school…and they were right. I think some therapists just assume a patient’s quad will just come back or that it is good enough. Don’t assume – test it out (do 1 RMs or test MVIC on a Biodex if you have one). With all the research out there about quad deficits persisting after ACL reconstruction, I am still amazed at how many therapists don’t emphasize restoring quad strength and see it all the way through. Therapists use basic, ineffective exercises (i.e. SLR’s, TKE’s, etc) for entirely too long. If anyone wants to start a petition to ban therapists from using SLRs (as an exercise, not as a movement pattern to assess), I’ll gladly sign. Therapists don’t load exercises enough and/or they don’t progress them enough - if you want to strengthen and hypertrophy the quad, you have to actually stress it and program accordingly. This point obviously piggy-backs off the previous one. Exercises are done with 2 legs instead of isolating the involved side – your body will naturally bias the uninvolved side when you perform a two-legged exercise. Limited visits by insurance companies – I don’t think I have to say much here, we all know how comical the number of visits they approve is. Using NMES incorrectly (or not even at all) – NMES is like the quad savior for the first 6 weeks or so. Since you can’t stress the quad that much through exercise because of pain, limited motion, etc, NMES helps activate those nerves/muscle fibers and prevent (or at least slow down) atrophy. NMES is especially important for patients who are NWB because of concomitant injury (i.e. meniscal repair). I’m pretty sure we all work on scars to make sure they heal well and that’s a good thing. But, relatively recently I’ve realized that even after they are all healed, scars can alter the function of muscles along the respective fascial chain that the scar is located in. This altered activation is due to neurophysiological effects (what isn’t due to that nowadays!?). So by scar management, I mean continuing to address them even after they have healed. Typically, I use IASTM and/or rocktape over the incision/portal sites to help “normalize” this area in the brain.